Updated with more comments from the km and some screenshots (launcher is ADW Launcher). My comment about there being no reason not to root sparked a bit of discussion concerning the custom UIs. Now that the Xperia X10 has been rooted, reader km weighed in with his experience. In short, SE's custom UI and apps remain intact after rooting (for better or for worse). My story: After a long wait and a couple of hoaxes, a tried-and-true method for root was finally posted on the xda-developers forums. However, with all the activity on the forums, the discovery of various issues with the root methods, and the continual updates and expansions to the root method, it was a mess keeping track of everything. There was no way I would be able to work through the thousands of posts to get a grip on every angle of the process, so I decided to just go for it. However, I live in Japan and I had my Xperia's locale set to Japanese, so I was weary of loading the generic UK R2BA020 rom because I was afraid of losing the ability to have the phone be fully functional in Japanese on the Docomo network like I need it to. After reading a few blog posts from Japanese bloggers who had tried the original procedure, but not the new rom, I eventually decided to give it a go. One thing that is seldom mentioned is that you must install the Sony Ericcson Update Service (SEUS) available on the company's website to get the necessary drivers to make the root commands work successfully. You also need the latest version of Sun's JRE, and some people say you also need JDK (I installed both just in case). The procedure outlined in the video worked perfectly for me on the first try after I set up these requirements. The POBox Touch keyboard was still there, working in both Japanese and English after I set my locale to Japanese again. As an added bonus, you get the excellent keyboard from HTC's Sense UI which is blazingly fast and has excellent error correction for English. Timescape and Mediascape, two big resource hogs on the X10, were programs I wanted to remove immediately, but apparently doing so has the potential to cause problems. The Timescape app in particular seems to be tied to the connectivity functions on the phone. This will be remedied when roms are released that do not include Sony Ericcson's Rachael customization of the Android UI. The procedure I followed installs the ADW home screen, which is a big improvement over the stock Launcher because it allows multiple screens, has nice bouncy physics when scrolling, and a more attractive application list instead of the slide-up drawer standard to most UIs. As I mentioned, I was worried about setting up the phone properly without any of the Docomo pre-loaded software on the device, but by putting in the appropriate APN information for my data plan (which I confirmed with you) I was able to get 3G working. Normal phone calls worked without any trouble. The proof about whether it is set up properly will be on my next bill, but I am assuming that since others have done the same without issue it should be OK.
Wireless tethering works flawlessly with Barnacle after putting athwlan0 as the LAN device in the preferences, and the connection speeds in my area (Kobe) are good on Docomo's network. SetCPU has really improved my battery life by keeping CPU scaling to a minimum when the screen is off. I can keep a charge with moderate use for well over and entire day now, whereas the original software on the phone back in April when it was released wouldn't give me more than 12 hours or so. Another major benefit is that the interface is snappier with the R2BA020 rom than it was with the Docomo rom that came with the phone. Menus appear more quickly, buttons and confirmation dialogues respond soundly with no lag, and the touch screen algorithms are as good or better than the recent software updates from Docomo that were distributed a few weeks ago. Overall, I am very happy with my rooted phone and I notice no issues whatsoever. I am looking forward to custom roms of more recent versions of Android coming out. Of particular interest is whether the touchscreen on the Xperia will support multitouch or pinch-to-zoom functions. SE reps have stated conclusively that multitouch is impossible due to hardware limitations, but that is just really hard to believe on a phone with these kind of high-end specs. However, pinch to zoom (which is the primary use of multitouch, aside from faster keyboard typing with two fingers) may still be possible. We shall see! The Rachael UI is still in tact, and I haven't bothered theming the phone yet, so my phone looks and acts similar to before, just *better*. As such, screenshots probably wouldn't be all that interesting... just my wallpaper and icons, or maybe some settings shots if you wanted them for reference. Now, a final point of caution: some people (myself included) will want to remove several of the bundled apps that came with the phone. You can do this with one of the many cleanup scripts available in the xda forums. I personally removed the Moxier suite of applications, along with the Korean and Chinese keyboards, PlayNow, and a couple of other annoying programs in my applications list. However, I accidentally deleted the excellent POBox Touch keyboard that allowed fast and easy switching between Japanese and English input. Be weary of following the cleanup script instructions you find without taking a look and understanding what you are removing with each instruction, and be sure to backup to SD before deleting. This should definitely be the last consideration when you root your phone, as it is not strictly necessary, nor does it provide any functionality other than a few more free megabytes of storage and a cleaner applications menu. As I mentioned, removing Mediascape and Timescape is probably not a wise decision for now since they are so firmly tied with the Rachael UI. Actually if you had used the older rooting method, you can stay on the SO-01B firmware, but might be buggy. ぐるなび released an android app on the market in April, by the way. I just found it after reading your comment. Actually, I see that each are on the market (as copy protected apps) and run on my phone rooted ht-03a running CM-5. The yomiuri app seems to be a lite app with just a few sentences, while the mainichi app seems to have more content. Looks like the compass is only available as warez. It also seems like the GPS 現在地 function hasn't been working very well after root. I haven't been able to get accurate GPS readings for a couple of days... granted, the weather here has been pretty cloudy. I will keep an eye on this and see if it is an issue or not. Out of curiosity, with 1.6 on the xperia, does the location marker in Maps point in a particular direction based on your GPS heading or your compass heading. With 2.1, the direction in which the arrow points is set by the compass. It took me a while to notice this nice upgrade because it was a bit subtle. In the end I managed to extract the pocket_rashinban.apk from the original firmware and it works fine on the rooted UK 025 firmware. The original docomo_market.apk fails because of the HTTP client headers it sends from the UK firmware I believe. Mixiplugin.apk doesn't work with the UK TimeScape, Mora Touch fails too due to UK firmware. The compass doesn't turn on the latest Maps for 1.6, probably a 2.x feature? GPS/Compass does work fine, i.e. ぐるなび would point you to the locations with the compass fine. 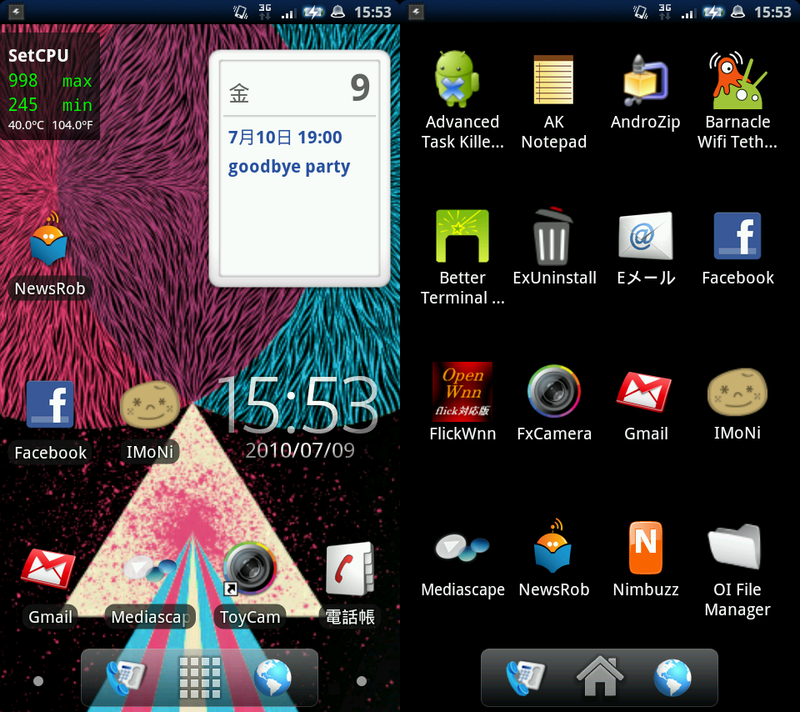 Hopefull the xda crowd with have a ROM customiser some time in the future. The compass did turn on the version of Google Maps that came with the Xperia, i.e. every upgrade after that broke it. If that was a 2.x feature, then perhaps Docomo/SE had a customized version to make it work. Google Maps is extremely difficult to use without the compass functionality, so I am really looking forward to that getting worked out. I concur with Anon that about the only things that would make me think about going back to non-rooted would be native imode.net (maybe with better emoticons? I hate the stupid ms-paint quality ones that it uses now...) or 2.1... and even then maybe not. You will have to tweak the parameters set in /etc/build.prop or /etc/system.prop, if you have a root shell # you can type getprop to see what has been set. If you look at http://demo1.noser.com/droidparade/droidparade.html, you will see some SO-01B vs X10i X10a parameters.